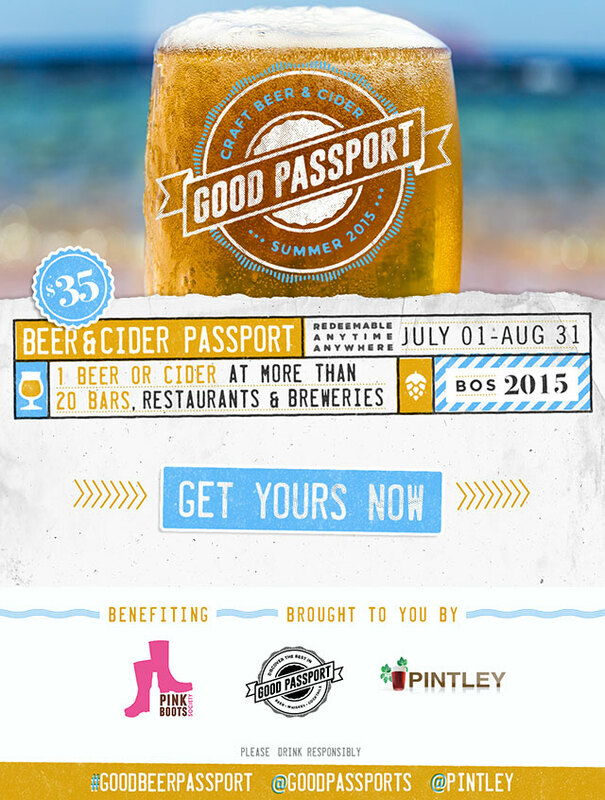 Pintley and Good Passports are proud to present The Boston Summer Good Beer & Cider Passport! By purchasing a passport, you’ll get one full craft beer or cider at every one of the 20 participating locations. You can use them any day, any time from July 1st through August 31st, 2015. So grab your friends, enjoy the beautiful weather we finally have, and go on an adventure through the world of Boston’s Craft Beer & Cider this summer! Buy a ticket for the location where you would like to pick up your passport now through July 31st. Pick up your passport at the location you chose any day from July 1st through July 31st, 2015. Valid only once per location. Please remember to tip your bartenders as gratuity is not included. …More locations to be announced! If you are a bar, restaurant, brewery or cider house interested in participating, please contact Rachel @ info@pintley.com by June 12th. Pintley is a craft beer community connecting drinkers, brewers, and bars. Drinkers use Pintley to discover great beer. Pintley learns from your tastes, suggests beers you’ll love, and invites you to free local beer tastings where you can try them. Brewers and bars use Pintley to grow. Pintley’s craft beer events help bar managers fill their bars on slow nights, while helping breweries reach new audiences and accounts. Good Passports work with bars, restaurants, breweries and alcohol retailers to drive in customers by creating limited time promotions with multiple venues. Customers acquire a passport that guides them around a city where they get to sample various drinks at a number of different locations. By purchasing a passport, customers also receive a periodic email newsletter alerting them of cool and exclusive events from the participating locations. The Good Passports © 2019. All Rights Reserved.